** Does not include grab bar. Grab bar sold separately. The Solid Mount is uniquely designed for installing grab-bars into pre-existing fiberglass showers/tubs. The Solid Mount can take up to 50-60 minutes to install. Prevent tearing apart walls during installation of any grab-bar. The Solid Mount is installed through the face of the fiberglass panel and uses a patented mounting assembly that attaches to the stud, sealing the hole and leaving a mounting surface to which a standard grab bar can be easily attached. This installation meets or exceeds A.N.S.I. and A.D.A requirements. The only Mounting Bracket designed specifically for fiberglass Showers and Tubs. The Solid Mount will span the distance of 7/8" to 2 1/8" from the fiberglass surround to the 2x4 in the wall and is the one and only Patented fastening system designed specifically for installing grab-bars into a Fiberglass Shower or Fiberglass Tub. Do you ever feel your Fiberglass Shower or Fiberglass Tub could be safer? Have you ever felt your feet slip in your Fiberglass Shower or Fiberglass Tub? Do you ever feel like you have nothing solid to hold onto, so you can balance yourself when you are in your Fiberglass Shower or Fiberglass Tub? Would you like something solid to hold on to as you enter and exit your Fiberglass Shower or Fiberglass Tub? The Solid Mount is the solution for giving you a safe and secure shower or bathing experience. Fiberglass walls have no structural or stable support, not only will the fiberglass shower or fiberglass tub walls flex when pushed against but they also can crack and break over time from continual pushing or pulling. 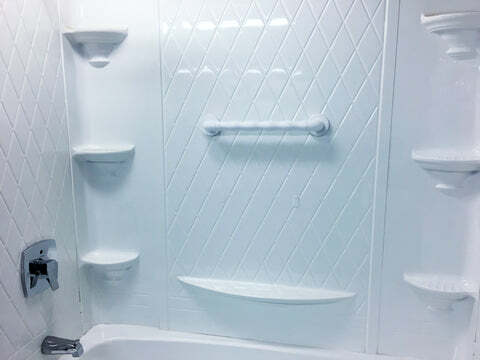 Safely and securely install a Grab Bar into your Fiberglass Shower or Fiberglass Tub. The Solid Mount does not rely on the fiberglass of the shower or tub for any of its support or strength it gets all of its support and strength from the structural 2x4's that are already part of the walls in your home.